New Musik were an English synthpop group active from 1977 to 1982. New Musik formed in 1977 in London, growing out of a casual band of South London school friends who jammed together under the name End of the World. Songwriter and record producer Tony Mansfield was the lead vocalist and frontman for the band, who was also a former member of the Nick Straker Band, and was joined in the original line-up by Straker, bassist Tony Hibbert and drummer Phil Towner. The latter had played on The Buggles' hit single, "Video Killed the Radio Star". Rather than immediately pursue a recording contract, the newly christened New Musik chose to hone their craft first. Working during down times at a recording studio where Mansfield was informally employed as a session musician and apprentice sound engineer, the foursome recorded most of what would become their first two albums before approaching the UK record label, GTO Records with the finished master tapes. However, before GTO released the first New Musik single, "Straight Lines", in August 1979, Straker had left for a solo career, scoring a minor UK hit single with the song "A Walk in the Park". He was replaced by Clive Gates, and the new line-up completed New Musik's debut album, From A to B, which was released in April 1980. New Musik made their first appearance on the BBC TV pop programme, Top of the Pops, in October 1979 with their debut "Straight Lines", which received airplay on BBC Radio 1 from guest DJ Frank Zappa, and also on WPIX-FM in New York. From A to B reached the Top 40 in the UK Albums Chart and contained four hit singles: "Straight Lines", "Living by Numbers", "This World of Water" and "Sanctuary". The band also topped the French singles chart with "On Islands" from the same album. Touring the UK in 1980, New Musik performed at both the Oxford and Cambridge Balls with Elvis Costello; and the Rotterdam New Pop 1980 festival in the Netherlands. In 1981, the band played a second UK tour and were featured in a 1981 documentary film, Listen to London, performing "Straight Lines" and "This World of Water". The band's second album, Anywhere, was released in 1981 and reached #68 in the UK. The album's single releases, "Luxury" and "While You Wait", did not chart. In 1981, a compilation album, Sanctuary, was released exclusively in the United States, consisting of five tracks from From A to B and seven from Anywhere. Previous to this release, there had also been a four song 10" vinyl "Straight Lines" released by CBS Records in the U.S. as part of their short-lived Epic 'Nu-Disk' series, which had also included The Clash's, Black Market Clash. After Anywhere 's disappointing commercial performance in the UK and Sanctuary's instant oblivion in the U.S., New Musik went through a period of turmoil. Hibbert and Towner both left the band, leaving Mansfield and Gates to record next New Musik album as a duo with a hired drummer. 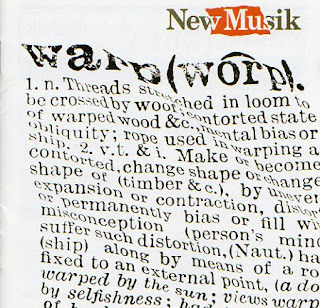 After the demise of GTO Records, the band released their third and final album, Warp, in 1982 which was more experimental than their previous releases. Warp was almost entirely electronic, and one of the first albums to be recorded primarily with digital samplers and emulators. It featured a synthesized version of The Beatles' hit song "All You Need Is Love", alongside an identically titled track of their own. 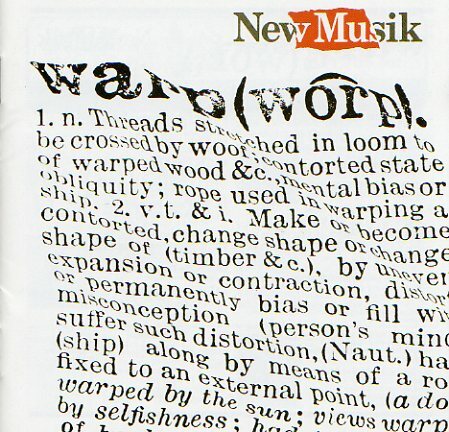 New Musik disbanded shortly after its release that year.